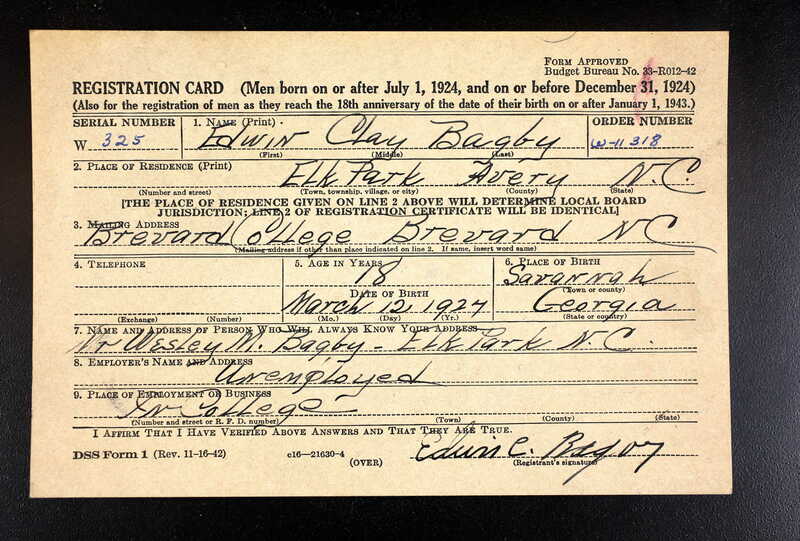 The draft registration card for Edwin Clay Bagby. The card lists a serial number, the name of the registrant, the order number, the place of residence, the mailing address, telephone, age, place of birth, state, date of birth, the reference and their address, their employer and place of employment. Born in Savannah, Georgia, on March 12, 1927, Bagby served in the United States Army from November 8, 1950, to November 7, 1952, during the Korean War. In addition to being scholars, much of the Bagby family served in the military. Bagby completed his service as a corporal, concluding his service on November 7, 1952. He spent most of his life in Miami, Florida. He died on April 10, 1996, and is buried at the Florida National Cemetery in Bushnell, Florida. Digital reproduction of original draft registration card, March 12, 1945. Originally created by Edwin Bagby and published by the War Department, Office of Provost Marshal General, Selective Service System. Black, Jeremy. World War Two: A Military History. London [u.a]: Routledge, 2003. Bagby, Edwin C. and War Department, Office of Provost Marshal General, Selective Service System. 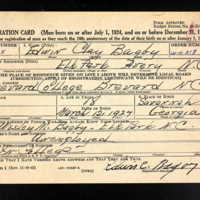 “Draft Registration Card, 1945.” RICHES of Central Florida accessed April 21, 2019, https://richesmi.cah.ucf.edu/omeka/items/show/10155.